The first thing that struck me about this book was its superb cover—a large, cuddly bear peeking beneath the surface of the water, smiling at a fish, in luscious blues and warming yellows. Next was the fabulous typeface and cover layout. Inside the front cover, I met with simple yet utterly adorable endpapers, and then visually-linked half and full title pages that made me smile. The next thing I encountered was a blue bird and an enormous, cuddly bear with the sweetest, warmest smile on his face, embraced by loads of white space and gloriously large typeface for early readers. 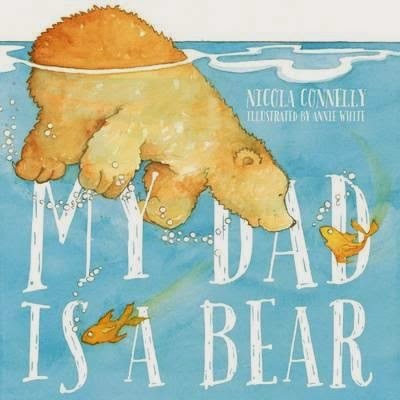 On the next page a sweet little rabbit and a beautifully-rendered tree appeared … and on it went, each page more engaging than the next as our narrator tells us how very much her dad is like a bear. He is soft and furry like a bear. He gathers like a bear. He sleeps like a bear and sometimes he even growls like a bear. But what is the thing our narrator, Charlie, loves most about her bearlike Dad? You’ll have to read the book to find out! I just love the simplicity, warmth and rhythm of this book. It features some of my favourite Annie White illustrations ever—of the type both children and adults will pore over. Truly heart-warming and a wonderful Father’s Day treat.